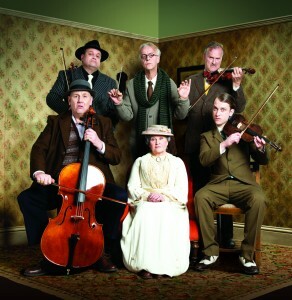 Revamped by Graham Linehan for the 21st Century audience, The Ladykillers is far less sinister than its title suggests and its original incarnation. In a crumbling house on an assuming street in King's Cross, London lives an elderly lady, Mrs Wilberforce, and her scrawny, often heard but rarely seen, parrot General George. She unwittingly rents her spare room to a band of criminals posing as a string quintet who are in the midst of planning an audacious heist. Michele Dotrice captures the essence of the formidable yet doddering Mrs Wilberforce. Her frail, stumbling portrayal masks a mind that's sharper than she's given credit for but surely a little old lady is no match for these hardened criminals? Leading the not so musical quintet, Paul Brown's portrayal of Professor Marcus would have benefited from more malice but his evil genius and traditional villain stance is unmistakable. Shaun Williamson is scene stealing as the violin case wielding Louis terrified of old ladies after a childhood experience. Somewhat bizarrely the nervous wreck Major Courtney [Clive Mantle] reveals a penchant for cross-dressing. My personal favourite was the lovable and grossly under-estimated One-Round [Chris McCalphy]. McCalphy portrays One-Round almost like a doting grandson endearing him to the audience more than the rest of the quintet. The pill-popping, over-charged obsessive cleaner Harry [William Troughton] completes the unlikely band. The intriguing home of Mrs Wilberforce is almost another cast member such is its sleight of hand and party tricks to reveal itself. The set dominates the stage and a clever use of remote control cars allows a creative staging of the heist. An enjoyable, farcical night out, it does become a case of "survival of the fittest" as the audience waits to discover just how will they manage to pull off a concert for Mrs Wilberforce's friends (hysterical) and who will be left standing at the end of the night? The sheer volume of murders and creative deaths only add to the comedy resulting in a macabre yet hilarious evening of theatre.